The most awaited iOS game by Gameloft ‘Backstab’ is now available for your iDevices for $6.99. You’ll need iOS 4 or above to enjoy Gameloft’s Backstab on iPhone. After having a great response at Sony’s Xperia Play, Backstab seems to make its way to top charts on iTunes store sooner as it’s getting very good reviews and people are just crazy about it. iOS Backstab the 3D adventure game in gangster style has a very good storyboard due to which it gets interesting as you proceed. 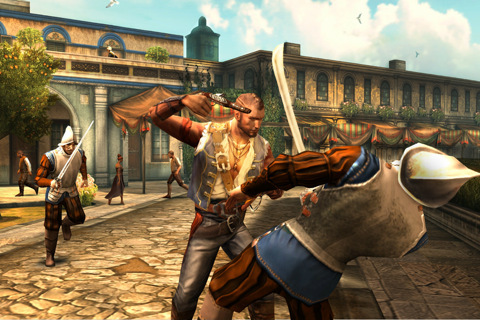 But according to some players, the game is a mixture of Assassin Creed and Pirates of Caribbean. On technical side, the 3D controls are just perfect on iPhone’s retina display, making it a great experience. The iOS Backstab gameplay is great but at some places the graphics seem to be not so good and can be improved. In nutshell the iPhone Backstab is good game to have for $6.99, and the storyboard, graphics, controls and the display overall won’t let your hopes down and you’ll certainly enjoy a totally different style of iPhone gaming.